This is part one of a three part article; part two is here and the final part is here. In the article I didn’t want to distract from the main point by going too deeply into the nature of the illness, but I will do here. 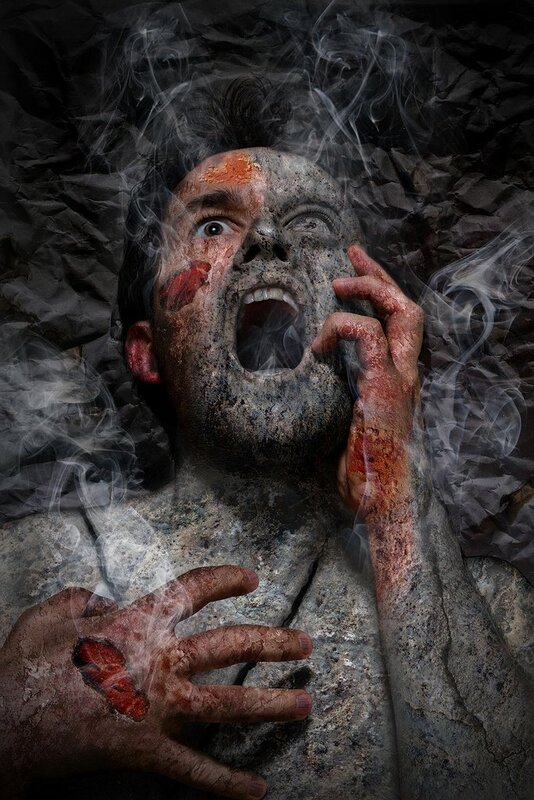 The illness was eczema, and if you have ever suffered from it or related diseases like psoriasis, you will know what a hell on Earth it can be. Firstly, it is in itself very painful and uncomfortable – you want to scratch but you know you shouldn’t… eventually you can’t help it and you do, which helps for a few minutes, but it starts bleeding, eventually maybe the wound gets infected and your immune system has to work overtime fighting the infection (even as it is already working hard to create the eczema in the first place, more of which later). Also it looks very ugly, especially if it appears on the face, as it does in many instances (and did in my case); you feel that you are a disgusting monster and it destroys self-confidence like a bulldozer knocking down a run-down old shack. People generally don’t know how much you are suffering and tend not to take it seriously; they assume it is a minor irritation and expect you to get on with your life as normal. For me, one of the worst factors of having eczema was that it was too painful for me to be able to sleep properly, and that brings with it a whole world of trouble – you have no concentration, you are just like a zombie during the day having barely slept at night, your energy is super-low, you don’t want to see other people, you are less able to take care of yourself, and eventually you become seriously depressed. Modern medicine, in my experience anyway, views eczema as incurable – I was told this several times by doctors both in the UK and in Spain, where I now live. They offer creams and tablets which relieve the symptoms, but you are given no hope that it could ever get better. I won’t go too deeply into all the alternative therapies I tried in addition to allopathic medicine; some were completely ineffective, and some, like acupuncture, had been very effective in the past, but now, during the serious attack I am talking about here, even this would have only a temporary effect; within a day or so I was just as bad as ever. My cousin had been a dietician and had recommended that I stop eating wheat and other foods containing gluten, plus also stop drinking alcohol (I didn’t drink much alcohol as it was, so actually giving up this and caffeine was easier than giving up wheat). However in my desperation to not make the eczema worse, I ended up eating mostly rice, vegetables and fish, and not really enough of any of that, so I lost a lot of weight and this added to the depletion of my overall health. I realised later that diet was an important factor in the attempt to cure the disease, and I will expand more on that in the second part of this article. Despite all this, I had the inner conviction that eczema was not incurable, and that what I was going through was a ‘healing crisis’, rather than merely a particularly bad bout of an illness that was going to plague me until the day I died. Had I known it was going to last for over three years I might have chosen to end it all right then, as even the next five minutes looked a daunting proposition to get through at times. I was having some strange ‘side effects’ to the illness though (and if you are not particularly interested in what we might call the psychological or spiritual aspect to this story, you can safely skip this part) – often, lying in bed unable to sleep, I would have odd ‘visions’ – images coming from who knows where, which seemed to be carrying some sort of oblique message for me. I intensified this by sometimes doing one of Stuart Wilde’s guided meditations, listening on headphones, where he would lead you in your imagination into a secret garden, and from there, once in a kind of shamanic trance state, a ‘journey’ could take place into realms unknown. I can’t remember if it was during one of these ‘journeys’ or just spontaneously, but one time a very powerful vision arose of the Holy Grail, but in a kind of classic optical illusion where the cup is made by the profiles of two faces. This was accompanied by a vision of the beach at Cadaqués, near where I live, where my ex-girlfriend and I had shared a particularly emotional moment in our relationship. I realised the meaning of the Holy Grail – it is a state of perfect equilibrium between the opposites; the polarities which make up existence – male and female, black and white, hard and soft etc. – and out of this polarity flows a ‘third’ force, which one might call the energy of perfection or possibly the divine. This image took me by surprise because I have never been a Christian by any stretch of the imagination, other than a cultural one by virtue of being born in a nominally Christian country, the UK. 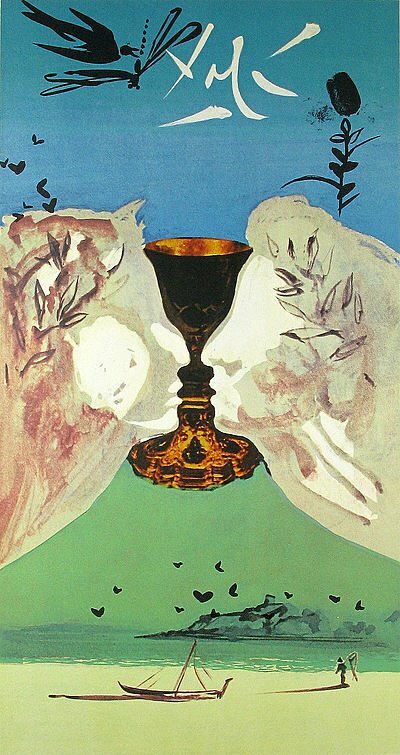 Shortly after that I saw (I think on Facebook), the Salvador Dalí design for the tarot card, the Ace of Cups, which is that same optical illusion, and whose background is the beach at Port Lligat, just around the headland from the beach at Cadaqués. I am not claiming that I had never seen this before; I almost certainly had seen it sometime, but it was not something I had ever more than glanced at, maybe in a library book about Dalí years before. What was new was the understanding of the meaning of the card and how it related to me personally: the clear message was that my life was seriously out of balance and that in order to be healed I needed to connect with the part of myself which was already healed, already in equilibrium. This also awakened in me an interest in the Tarot; I had been occasionally using the I-Ching but had never really looked into the ancient Western magickal tradition, of which the Tarot forms a part. 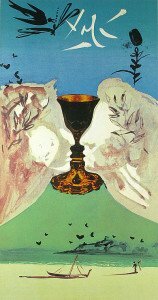 I’m sure Dalí intended to make the correlation between the Holy Grail and the Ace of Cups as he was what might be referred to as a ‘Cosmic Christian’ late in his life when these cards were designed. So, despite my utter desolation at being in pain nearly all of the time and unable to sleep, I carried within me a kind of conviction that all this was happening for a reason and that I would eventually come out of it, although I have to say I knew that there was a chance of the doctors being right about me having to live with it in some form for the rest of my life. However, after this initial series of visions, and the insight that I needed to look into the issue of the Shadow as it is described by Jungian psychology, things went very dark. You might be asking why I was not receiving enough medical assistance to alleviate my suffering – unfortunately in Spain the healthcare system is mired in both bureaucracy and austerity, and as a foreigner, unless it was classed as an emergency I was unable to receive the free State healthcare at that time. I was not working much due to the lack of sleep so private health insurance was also out of the question. I kept the worst of my suffering hidden from my parents (who would otherwise have helped me) as I didn’t want them to worry unduly, and I always felt that a cure was just around the corner. At the hospital they gave me the steroid Prednisone in pill form, and I have to say this worked a treat – I had several months completely eczema free and was starting to enjoy life again, until the moment that I was eating some cereal for breakfast and one of my teeth just broke in half. I had heard that steroids could cause osteoporosis or other nasty side effects, but I had seemingly avoided these. I realised the full extent of the damage when I broke two more teeth within the next two or three weeks, and resolved to stop taking the steroids again. I had known that steroids could be harmful from personal experience as I had seen how the steroid creams I had been given when I only had small patches of eczema would thin the skin quite dramatically. So… back to the eczema, back to the pain and back to the sleepless nights… for months… I can hardly remember much of what happened back then as I was really only surviving, not actually living. Everything felt wrong, I was angry, frustrated, depressed, massively tired, in constant pain which ranged from uncomfortable to agonizing, and totally desperate. I could not see any way out. I had no idea I could feel as bad as this, and I had been an eczema sufferer for years, on and off, had had my heart broken several times, struggled with depression and low self-esteem… but this really took the cake. I felt like the epitome of a victim. The thing I really took away from that book, which is related to the notion of a complete surrender, is the idea of giving up one’s ‘victim mentality’, one’s identity as ‘someone who suffers’, who complains to friends about it, eliciting sympathy, and ultimately garnering a feeling of being ‘special’ – this is a ‘consolation prize’ for being unwell, and it may be that it keeps people stuck in their illness, as this victimhood as ‘the one who is ill’ becomes who they are, and they are unable to imagine who they would be without it. It is almost like the ‘Stockholm Syndrome’ of people who start to sympathise with their kidnappers, or the institutionalisation which takes place when one has been incarcerated in a prison or psychiatric hospital for a long period of time. “Just wanted to share with you some thoughts I’ve had about eczema and why it seems such an ‘insoluble’ problem; that is a problem with no solution. Before going to sleep the other night I was reading the excellent book ‘Owning Your Own Shadow’ by Robert A. Johnson, and he mentions that spiritual breakthroughs always come when there are two opposites opposing each other with great force – when no further movement is possible, a paradox is created and the solution comes out of that. Then later that night I woke up because I was itching with the eczema and I knew I wouldn’t get back to sleep so I listened to some Eckhart Tolle on my mp3 player. He was saying that in extreme suffering, often the gateway to the divine opens, and that this is the meaning of the Christian symbol of Christ on the cross – it is simultaneously a symbol of suffering but also of transcendence, and this was exactly what Johnson is saying in the book as well. All of this made me realise that in a way there is no solution to severe eczema because it is a ‘spiritual’ dis-ease – it is meant to bring you to a point of complete despair where your mind has no more solutions and basically surrenders to what is. So I was trying to surrender but I realised that I was still imagining an ‘I’ who has to surrender and it wasn’t working. So then I just gave up pretending that I knew anything about anything, admitted I didn’t know what to do, didn’t know how to surrender, didn’t know who I was etc etc. And in this way I really surrendered and there was a breakthrough – and I realised that the eczema had been leading me to this point of surrender all along. There is the desire to be cured of the eczema, and there is the fact that one has it, and these are two opposites fighting each other. This produces great despair, but in fact rather than being a negative thing, this is actually the only thing which allows one to transcend the mind and its solutions (‘if I try this, maybe I’ll be cured…’). Also this is a paradox because I believe that the only way to be cured is to surrender totally to the fact that one wants to be cured but cannot be. The next day I felt like a weight had been lifted from me, there was no more despair at a deep level, I felt like I had understood that life is always pushing us into these ‘no exit’ situations and this is the only thing which allows true breakthroughs to happen. Also we can see this in the situation in the world today; we are being pushed as a species towards a crisis point of utter despair, and from there the new solutions will arise. The Zen masters understood this when they set ‘koans’ for students: questions with no answer, like the famous ‘what is the sound of one hand clapping?’ – they knew the students would be pushed into a breakthrough by the tension created by this unsolvable problem. So I guess that in a way, eczema is a koan…”. So if eczema is a koan, it is a brutal one, and possibly one which comes to pass when the individual has been out of balance for a long time. It is said that we can choose the ‘path of Wisdom or the path of Woe’ – eczema is definitely the path of Woe, but the point is, they both lead to the same place – where we only know that we actually don’t know, and our precious self-importance has been dampened or even extinguished.